This is a work of fiction. Any resemblance of characters to actual persons, living or dead, is purely coincidental. Franzen and Egan hadn’t exactly been starved before the fight, but, as was the custom, they had been fed on a parsimonious diet of lean proteins, just enough to keep a corrosive hunger burning in their bellies without actually weakening them. Or, so he explained to her over the murmur of the crowd. In the stands, a thousand men were quietly explaining the rules of the game to a thousand women sitting next to them. How the prisoners would be fed a single slice of bread just before the games began, spiking their blood sugar after the long fast. How they had been sequestered in soundproof cells for months, able to hear only the sounds of their own voices. This was not as difficult for writers as it would be for other people, he explained. In fact, many writers expressed the opinion that their months in the cell had been very productive. He sucked his lower lip a little in anticipation. She felt it too, but would have been embarrassed to show it so publicly. The more typical attitude was one of suppressed bloodlust—eyes darting nervously behind square-rimmed glasses, blazers creaking over shifting shoulder blades, throats fluttering under artistically draped scarves. She had been avoiding the obvious topic of conversation, but since it was already being discussed in low voices all around them, she decided to bring it up first. The professor didn’t feel like arguing the point, and besides, it did seem pretty hopeless. The two might be evenly matched physically—Franzen was not exactly a paragon of physical prowess. But he was demonstrably more aggressive than Egan. Just look at the way he went on the offensive in ’96, preparing the canon for The Corrections even before he had finished writing it. Taking back the tradition, the commentators called it. And his bold refusal to accept a marketing advantage that would have boosted his readership by millions, because those readers were women who watched daytime television—that was a masterstroke. People might not like him, but he had always generated the buzz he needed to stay alive. And he wasn’t here to make friends. He did have glasses, she reminded herself, a definite handicap. The committee never allowed contestants to get fitted with contacts for the ring. The thought was that any author who had chosen to wear glasses instead of contacts their whole life had almost certainly done so in the hopes of benefitting from a more intellectual public image—a strategy whose efficacy had been proven time and again by the number of bespectacled contestants over the years. To let an author jettison the image that got him to the ring in the first place would be unfair, to his fans as well as his opponent. So if Egan could knock off his glasses early on, she might gain an enormous advantage. On the other hand, there were rumors flying around that the glasses were an affectation, that Franzen had first donned them to appear more interesting to girls at Swarthmore. This rumor was unlikely to be true, and was probably originated by Egan supporters trying to undermine Franzen’s image. However, Franzen fans—or “frans,” as they called themselves—had spread the rumor with glee, gloating that if Egan got close enough to knock off the spectacles she’d be in for the surprise of her life. The professor couldn’t help but shudder at the thought that it might be true. She abruptly closed the program and tightened her jaw. “Hey, you gonna be okay?” He put his hand on her elbow and leaned in. He really did love her a little bit, even years after their one unsuccessful date had shown that there was no hope of a romantic relationship between them. The concern in his voice touched a guilty place in her conscience, as she remembered his shattered look at the restaurant. Just as the crowd began to stir restlessly, the announcer’s face appeared again, and the camera began the crosscutting of the two interviews. The interviews were supposed to be broadcast live from their cells, a fact the announcer enthusiastically repeated every thirty or forty seconds, but nobody really believed they weren’t edited down to the most sensational bits, perhaps even rearranged to appear more in sync with one another. Egan and Franzen were shot cinematically in director’s chairs against a black background, each turned slightly in toward the center of the screen, so that when the camera cut back and forth it looked like they were facing off. Franzen, perched tensely on the canvas edge of his chair, was first. The interviewer asked him whether he had been writing anything in his cell. “I’ve been working on a piece about Edith Wharton,” he answered, blinking owlishly. Sounds of interest and surprise wafted up from the audience. 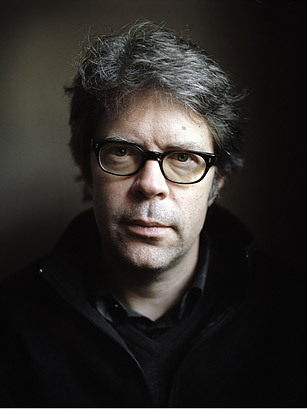 The camera cut back to Franzen, who had removed his glasses and was rubbing his eyes with his thumb and middle finger. “I don’t want to kill anyone. Christ, I can barely handle clearing the mouse traps in the attic.” The audience laughed sympathetically. He pulled his hand away, shook his head as if to clear it, and blinked his eyes open. The professor could feel her companion leaning forward, straining along with the rest of the audience members to discern some sign of imperfect eyesight. The glasses were on again in an instant, and a moan of frustration rippled through the crowd. There was a pause during which the only sound was that of audience members anxiously fiddling with their laptop bags. Shortly thereafter, the screen went dark, and the audience, unable to pretend indifference anymore, began to stomp and chant for the tournament to begin. The contestants were given their slices of bread, or, as a few men in the know were telling the women next to them, their carbohydrate shots, which is how they were doing it this year for the first time. They were released into the arena, Franzen in a sweater vest over a maroon button-down, and Egan in her signature boatneck top with navy horizontal stripes. The fight didn’t last long. 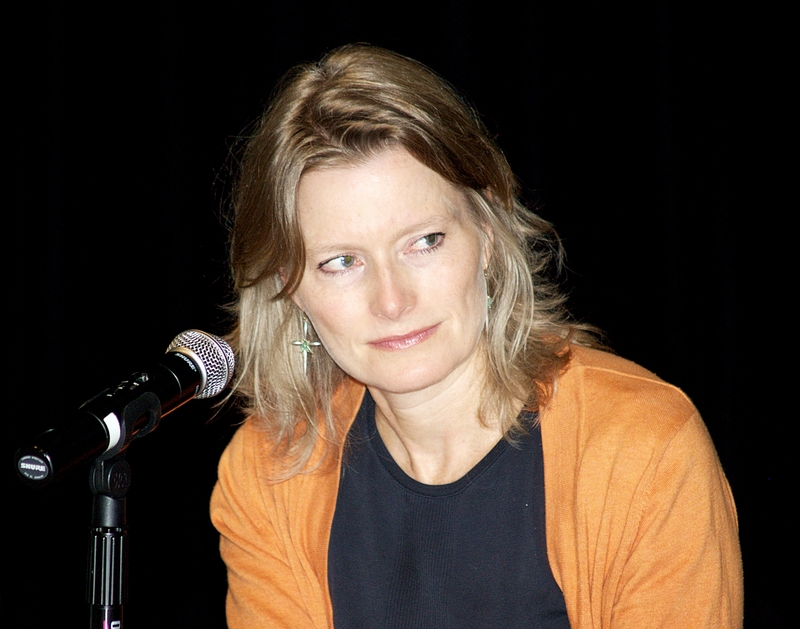 Jennifer Egan beheaded Jonathan Franzen fairly quickly, and, after a brief glance around the crowded stadium, walked out of the arena with a fatigued look on her face. A thousand women cheered and went home with plans to apply to graduate school and write their dissertations on Edith Wharton, Gertrude Stein, Zora Neale Hurston. A thousand men remained very quiet on the car ride home. The professor resigned and became a writer. Her friend resigned as well, but for different reasons. Jonathan Franzen’s essay on Edith Wharton was published posthumously in the New Yorker, and when people read it, with tears in their eyes, they thought how much better it would have been if he had at least had access to Wikipedia.